STUART, Fla. — Students are taking on the responsibility of protecting paradise in Martin County and beyond. "If we help act local and beautify our community then we’re ultimately helping protect our planet," said Adriana Mancini, founder of Students4H20. Adriana, now a junior in college, got inspired to take on environmental activism when she was still in elementary school. “I actually learned about the global water crisis when I was a fifth-grade student," she said. For every birthday she's celebrated since then, she's asked for donations to help developing countries get fresh water sources instead of birthday gifts, collecting $50,000 to date. “20 dollars can save the life of a child by providing them with clean drinking water for 20 years," she said. "I thought about all the things I could purchase with 20 dollars and that's when I knew I had to help make a difference." As a sophomore in high school, Adriana decided to get other students involved and expand her mission by forming Students4H20. “Kids are really important in this organization because they are not the generation of bystanders. They are the global citizens that are making a change in the community and planet," she said. Now, nearly 20 students from elementary, middle and high schools in Martin County are part of Students4H20. 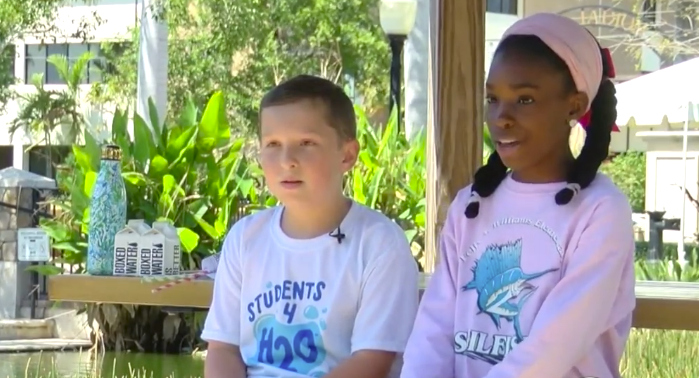 They'll host Water Fest in Memorial Park in Stuart this weekend. "If we don’t make a difference then other people might not and then we won’t have a change," said Ben Cermeno, a fourth grader. “We are the future leaders and we want to keep our planet healthy and stay the same way as we met it," said Sydney Daniel, also in fourth grade. The group started a plastic bag recycling initiative at Martin County schools, placing a plastic bag receptacle in each school that then goes to Publix for recycling. The students also recently added cigarette containers in Downtown Stuart to recycle cigarettes. "When it’s recycled and turned into something useful. It’s just amazing,” said Christopher Carnes, a freshman in high school. You'll see Students4H2O's name on a street sign along Georgia Avenue, which the students adopted to clean up. Water Fest is a free event at Memorial Park in Stuart from 10 a.m. to 2 p.m. Saturday. Students will hand out paper straws, reusable grocery bags for the first 200 people to bring a plastic bag to recycle and a carton of boxed water for those who bring a reusable water bottle to the water station.